The Southern Vanguard Health Insurance Company was bought out by the Republic Group. However, this company does not offer any type of health insurance coverage. Because of this, American Republic Health Insurance Company is being reviewed. Medical coverage is offered by American Republic Health Insurance companies to consumers living in more than 30 states. The American Republic Health Insurance Company is a subsidiary of the American Enterprise Group. Find out how you can get great health insurance rates by typing in your zip code! The American Republic Health Insurance Company has been in business for nearly 100 years. Anyone living in the company’s covered territories can purchase medical insurance from the American Republic Health Insurance Company. This health care provider also sells supplementary plans to consumers with limited budgets. The benefits offered by American Republic Health Insurance Company rival those offered by other large-scale insurance providers. Full-time employees are able to have their tuition offset by way of financial assistance offered by the American Republic Health Insurance Company as well as receive full medical benefits. To search for an open position, applicants need to go through the American Enterprise Group website. There, they can find apply for jobs and locate the contact information for human resources. An address for policyholders making insurance claims is also available. The best phone number to reach customer service at American Republic Health Insurance Company is 1-800-247-2190. Calls can be made 7:30AM – 5:30PM, CST. Insurance claims through the American Republic Health Insurance Company can be filed through standard mail or via the web. Health care providers are also given extensive information on what is required to successfully submit an insurance claim and have it approved. 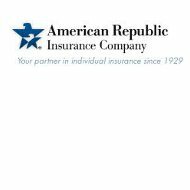 The American Republic Health Insurance Company also gives website visitors the opportunity to learn about fraudulent claims, their effects, and how to report suspected perpetrators of insurance fraud. An online submission form allows anonymous reports to be filed. The Nebraska Department of Insurance — Insurance Fraud Prevention Division http://www.doi.ne.gov/fraud/ifpdindex.htm has put together a wealth of online resources to help U.S. citizens better understand this topic. The American Republic Health Insurance Company uses online tools to help match visitors with the right health insurance plans. Users may elect to purchase medical coverage for themselves alone, their families or health plans for married couples. Consumers that have recently been laid off or fired have the opportunity buy basic medical coverage. Insurance can be purchased by independent organizations and business owners. More specific information on group rate policy rates can be obtained by calling customer service. Although prices and quotes are given over the phone, the easiest way to get a health insurance quote from American Republic Health Insurance Company is to go through the online quote portal. A series of questions concerning health, location, and general identifying information need to be answered before prices will be revealed. Older quotes can be recalled by logging into the American Republic Health Insurance Company website. Quotes for different insurance products may be higher or lower depending on your location. Consumers are able to get in contact with the American Republic Health Insurance Company by way of fax, phone, email, or standard mail. Inquiries are generally answered quickly and topics that require research are assigned to senior customer care agents. Policyholders that have registered for an online account can go to the American Republic Health Insurance website and make changes themselves. It is not known if customers can cancel coverage simply by logging in, but they can write or call in order to stop coverage. Get real time health insurance quotes once you submit your zip code!